Place all the ingredients in a mixing bowl and mix well. Knead until you get a smooth dough, about 6 minutes. Divide into 2 portions and set aside. Knead the flour and butter to a smooth dough. Divide into 2 portions and set aside. Dust a workspace with some flour and roll dough out to about 1/2cm thickness. Roll up tightly from one end to the other, like a Swiss roll. Turn the rolled-up dough around 90 degrees and repeat the previous step, rolling it out thinly again, then rolling again into a Swiss roll shape. Cut the dough roll into slices of 1/2 cm to 1 cm each. Heat the butter over medium heat, then fry the chopped onion until fragrant. Add the curry powder and minced chicken. Stir to mix, then add the durian. Stir well then add water, and cook till chicken and durian are done (the durian will have the texture of cooked potato). Season with palm sugar, soy sauce and salt. Continue cooking till mixture dries up a little. Remove from heat and set aside to cool. Take a piece of dough and flatten into a circle with your hands. Place 1 tablespoon filling into the middle of each circle, then fold in half to enclose the mixture. Pinch the edges to seal. 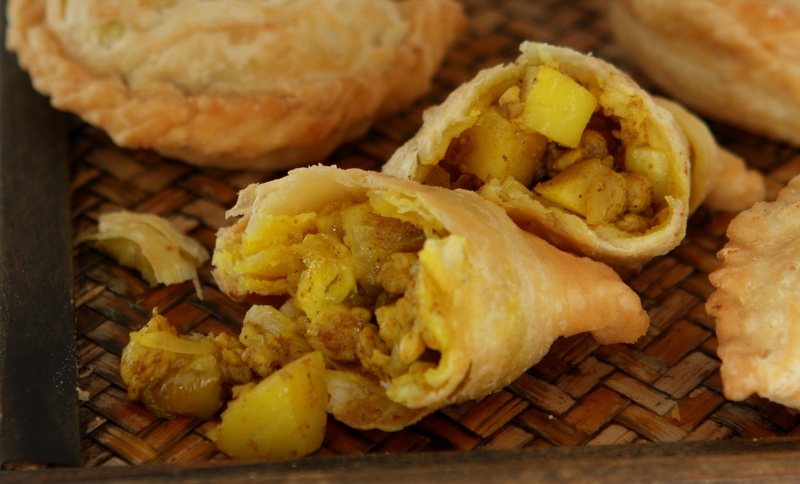 Heat oil over medium-high heat and deep-fry curry puffs in batches, for 1 to 2 minutes or until pastry is golden. Remove and drain of excess oil, transfer to a wire rack and allow to cool.